Grilled Vegetable Towers with Mozzarella are layered with grilled, marinated eggplant, zucchini, yellow squash, red onion and bell peppers topped with fresh mozzarella. 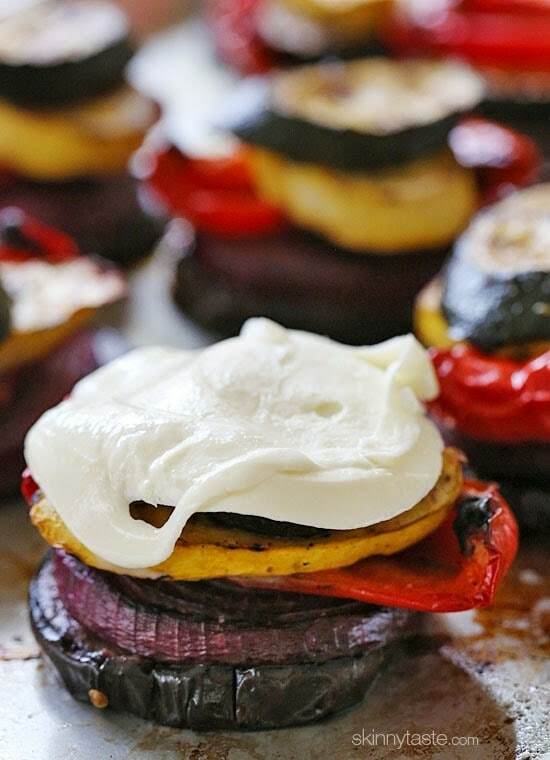 This grilled vegetable recipe is DELICIOUS and such a great way to enjoy the summer’s bounty. 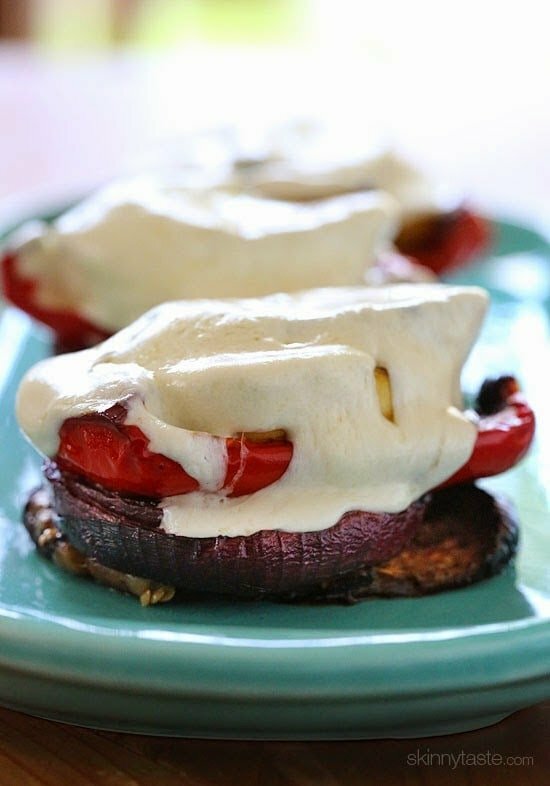 A few of my other favorite grilled veggie recipes are Grilled Portobello Mushroom Burgers, Honey Balsamic Grilled Chicken and Vegetables, and Grilled Rainbow Peppers with Cream Cheese. How If you prefer to grill them indoors, you can also grill the vegetables on a grill pan, then preheat to oven to 350°F, make your vegetable stacks on a baking sheet and melt the cheese in the oven. The vegetables can also be grilled a day ahead and reheated in the oven as well. If your vegetables are too small, you can put them on a stick to prevent them from falling through the grates like I did with these Grilled Brussels Sprouts. An outdoor grill pan is also a must, perfect for asparagus, cut peppers, onions, or anything that may fall through the grates. Wash and cut ends off vegetables. Cut the eggplant and red onion into 6 slices. Cut the zucchini and squash into 1/2-inch thick slices on the bias (diagonally). Cut the red pepper in half and remove innards. Cut in half once again. 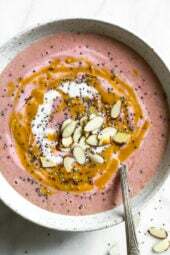 Place all ingredients of marinade into blender or place them into a container and use emulsion blender until all ingredients are blended until smooth. Combine the vegetables and marinade in a deep bowl or large plastic bag. Allow to sit for at least 1 to 2 hours. When ready to grill, remove vegetables from marinade with tongs and place vegetables directly on grill. Discard excess marinade. Grill the additional vegetables 4 to 5 minutes, until browned and soft, remove from grill and set aside. Using a small tin begin to create your tower of vegetables. Begin with the largest vegetable at the bottom. That will most likely be the eggplant, then the onion, red pepper, zucchini, and then the squash. Place a piece of basil in between any of the vegetables. Top the tower with the slice of mozzarella cheese, place back on grill and cover grill so the cheese melts, about 1 to 2 minutes. The marinade was awesome. Made it sans cheese (vegan) served with mash potato and drizzled a tomato sauce over! Absolutely delicious, thank you for the recipe. Husband also gave it a thumbs up even though he’s a carnivore ???? Made this yesterday, but with a portobella mushroom as the base, because I am not a fan of eggplant. They were AMAZING. Thanks. ^^That would be good! 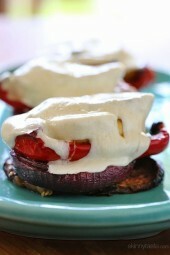 I love eggplant but for when I can't find them (or they're too pricey… I'll sub in the mushrooms!! Hi Gina! I really love this recipe. Wanted to let you know that I featured it in my monthly round-up of 25 Deliciously Healthy Low-Carb Recipes. I hope a lot of my readers will come over here and try it! This was wonderful! I swapped out the squash for portabella mushrooms and baked it in the oven. It it definitely a repeat recipe!! This is one of the best things I have eaten. Absolutely delicious!!!! Alright, it’s time for me to get my grill out! 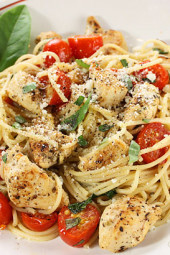 I’ve been seeing so many delicious recipes lately including this one! Hi Gina….looks like another winner!! I am going to have to use my grill pan indoors to make these. So how do I melt the cheese without a grill to cover? Do I use a broiler? Sorry….just don't want to ruin them! This looks so yummy! I'm going to try that out tomorrow. Gina, what do you serve with these? It is amazing that you can make it look so beautiful and taste delicious. This makes me want to load up the grandkids and head to the grocery. I don't understand the sentence "Using a small tin, begin to create your tower of vegetables." A tin what? Are you supposed to create this in a tin can? Then how would you remove it? I'm confused! Reading the ingredients in the marinade literally made my mouth water! 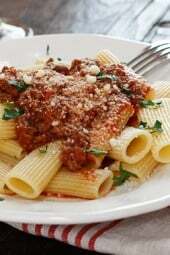 Gina, I'm loving these towers and the fresh mozzarella melted on top is just perfect! We already have everything to make this and will be trying it tomorrow. Made this tonight because we had everything in the fridge. It was fantastic! Thanks for coming up with so many fun, delicious vegetarian recipes. Yum! I love how simple and delicious this is — um, and the cheese, of course. Such a great way to get your veggies. Thank you for sharing! What a lovely vegetarian recipe. My kids will eat anything with melted cheese! 🙂 Thanks for sharing. That recipe sounds so good! Thank you soo much for sharing! can you use regular balsamic? Well, I'm sold at anything that has the word "tower" in it. YUM! These looks so fresh and delicious! Oh my goodness, I need to make this it looks so amazing! So many layers of vegetables & cheese!!! Looks great. I'll have to put it on next week's meal plan since I already have this week's made up.